Come by our two-part lemonade stand inside PSAC on Feb 11, 12 and 13th anytime from 10am to 2pm! 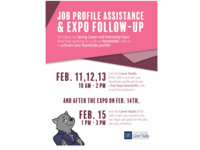 While enjoying some lemonade, you'll learn how to activate your free University job board profile and access the list of 60+ employers attending the Career Expo on Feb 14th. Wow! I think that this is the best time for me to get my job selection for a pretty good reason by this team who organized this event so greatly. I will attend this https://essayservicesjudge.com/review-edubirdie.php event for sure to hunt some better job for me while being at one place which is so nice. Anyways thanks a lot my friend for sharing all the details regarding this event.